Openers Sunil Narine and Chris Lynn tore the Rajasthan Royals bowling attack to shreds to help Kolkata Knight Riders notch up an easy eight-wicket win in their IPL match at Jaipur on Sunday. Jaipur: Openers Sunil Narine and Chris Lynn tore the Rajasthan Royals bowling attack to shreds to help Kolkata Knight Riders notch up an easy eight-wicket win in their IPL match at Jaipur on Sunday. 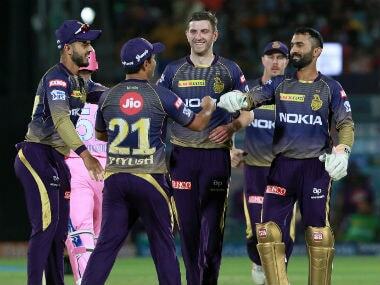 The win, which took KKR to the top of the table with eight points from five matches (4 wins and 1 loss), was the best of this season in terms of number of balls to spare. The stadium was also engulfed by a sandstorm before the tie but in the end it was the home side who were were swept away by KKR who first put up a brilliant bowling performance to restrict the Royals to 139/3 and then ran away with the match in quick time. The inside edge brushed the leg stump but the bails could not be dislodged, much to the misery of Kulkarni and the home team. The former Australia captain, who had been slapped with a one-year ban for his involvement in the infamous ball-tampering scandal in South Africa, hit seven fours and one six in his unbeaten knock. Buttler hit the first six of the match in 12th over bowled by debutant pacer Harry Gurney (2/25) but he was out while going for another big shot with Shubhman Gill taking a fine catch near the boundary ropes.